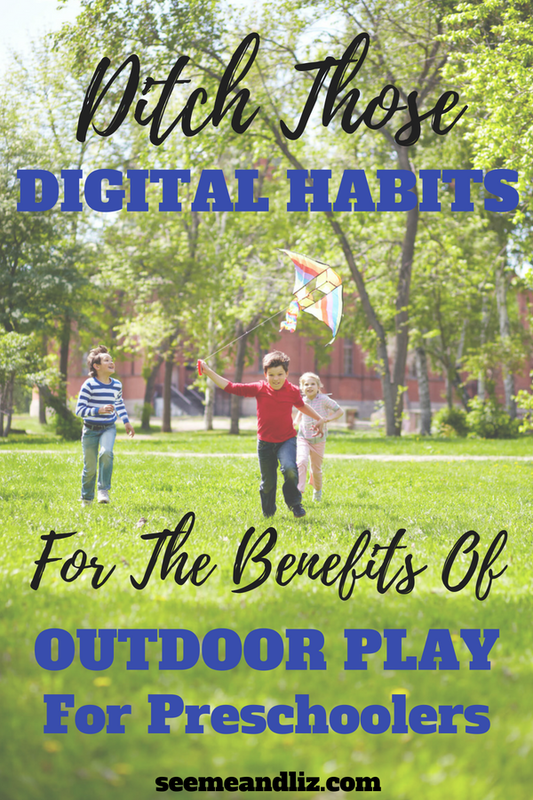 The benefits of outdoor play for preschoolers almost always outweigh any potential drawbacks! Yes, there is a chance your little one will get dirty, possibly covered in mud and perhaps she will even put a piece of grass in her mouth (fingers crossed it’s not a dried up worm – apparently I ate those as a young child, several times). I know, as adults we think that it’s a bit (or a lot) gross, but it won’t kill her! She might even fall and scrape her knee, but that is ok to! These days kids are indoors more than ever. Usually time spent inside is in front of a screen. And we are learning more and more that too much exposure to screens is not good for the developing brain of a young child! As long as there are no extreme weather conditions, there is no reason why children shouldn’t be outside playing. However, as a result of social media and instant access to the news, we often feel that there is more crime in the world now than 20+ years ago and therefore our children are no longer safe outside. But, this is not true. In fact, crime rates are decreasing, but we hear about crime so much more through the media. We hear of child abductions occurring 1000’s of miles from where we live and then generalize that the same thing must be happening everywhere. These crimes have always occurred throughout history, we just didn’t hear about them. I’m not going to link to the various studies and articles that have been written on the decrease in crime since there are articles pertaining to every part of the world. A quick google search should give you this information if you would like to read up on it. Sorry for the tangent, let’s get back to the topic of the benefits of outdoor play for preschoolers. Of course, adult supervision is always a good thing with a young child, especially if there is no fenced in yard. But try not to hover or direct your child’s play time. Outdoor Play For Preschoolers: 3 Reasons It’s A Must! Did you know that children who regularly play outside have better vision than those who do not? Playing outside also allows a child to naturally develop gross and fine motor skills. Running, jumping, skipping, hopping, climbing, etc. 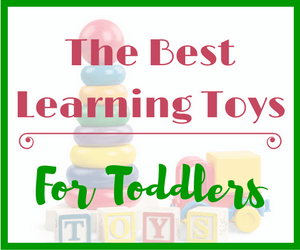 all help fine tune gross motor skills. Fine motor skills are also improved on when a child picks up a small pebble and drops it into a bucket, for example. When a preschooler is playing outside, he is probably not sitting still (like he would be inside in front of the TV). Rather, he is running around, rolling down a hill, jumping up to try and catch a butterfly. All of these actions burn calories. Obesity is becoming more and more prevalent due to our sedentary lifestyles, even in young children. So getting a child outside gets them active and moving! When children play outside, the natural light stimulates the pineal gland which is responsible for regulating our “biological clock”. 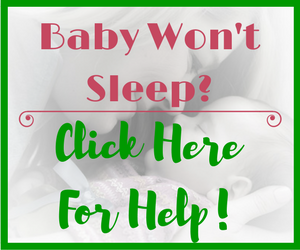 Thus outdoor play can be beneficial for sleep, and having quality sleep is essential for a child’s development! Getting outside and playing allows a child to strengthen their cognitive, social and emotional skills. Children need to use their imaginations in order to play outside. And nature provides them with so many interesting items that they can explore and incorporate into their play. Children can be seen making up new games to play with friends. In order to do this, they need to work together. They will have to take turns and work together to solve problems such as who goes first or if the “restaurant” will be serving a salad made with mud and sticks or sand and twigs. To an adult these decisions seem quite trivial but to a child these things are of the utmost importance. Children don’t realize that they are learning many new skills when they are running around outside. And often parents don’t realize this either. Many well meaning parents think their preschooler will benefit more from structured activities and team sports, however, this is not the case. Counting how many pebbles need to go into a bucket, keeping score in a game, etc. Nature is filled with new and interesting objects, insects, animals, actions, colors, etc. Talk to your child about all the fun things you discover outside. Children also learn new words from their peers. Taking turns, playing on a team, joint attention, topic maintenance (multiple children carrying on a conversation about the same idea). So many problems can be encountered outside that need to be solved (see examples above). Almost every sense can be triggered outside. For example, there are many bright colors to see, animals can be heard making sounds, or you can listen to the sound the wind makes going through the trees. Nature is filled with different textures such as smooth, rough, bumpy, hard, soft that a child can experience through touch. Fruits and vegetables grow outside that a child can taste, or like most children they will want to taste the snow and the rain. As you can see, each sense is used by being outside. When a child is inside in front of a screen they are only using the sense of sight and sound, and maybe touch if they are touching the screen. However, these are not nearly as varied as the sights, sounds and touch that can be experienced outside. So the next time it’s raining out, send your child into the backyard, driveway, balcony to hear, see, feel and taste (yes, I said taste) the rain! 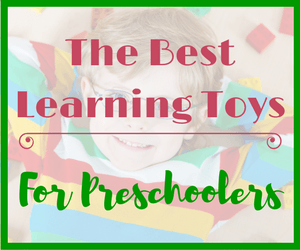 Will You Make Sure Your Preschooler Gets Plenty Of Outdoor Playtime? 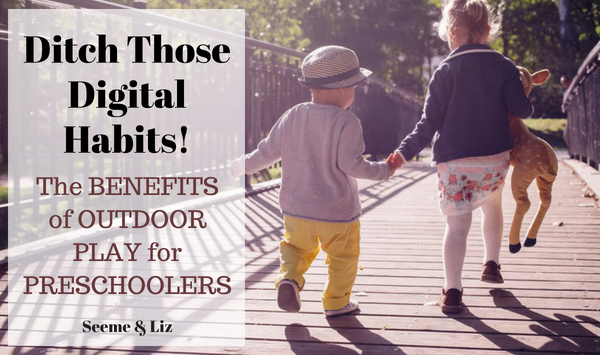 With all of the technology at their fingertips, children are choosing not to go outside because screens are fun! Trust me, I go through this with my own children. But outdoor time isn’t an option in our house. And often if it’s not screentime keeping children indoors it’s the fact that they are shuffled from one activity to the next. If these activities happen to be outdoors, that is great. But remember children need time to play freely in an unstructured environment (both indoors and out). I remember my parents kicking my sister and I out and saying “go play”. We would wander up to the little stream at the end of our street and use rocks to build a dam to see how much water would collect at the top of the stream. We’d find fallen trees (small ones) that we could drag across the stream to build a bridge. We caught many frogs and salamanders and made homes for them with old containers, sticks and grass. These are some of my fondest childhood memories. I want to leave you with something to think about. Did you know that children who climb trees perform better at school? If you want to know why, read this article from our friends at Gooey Brains! 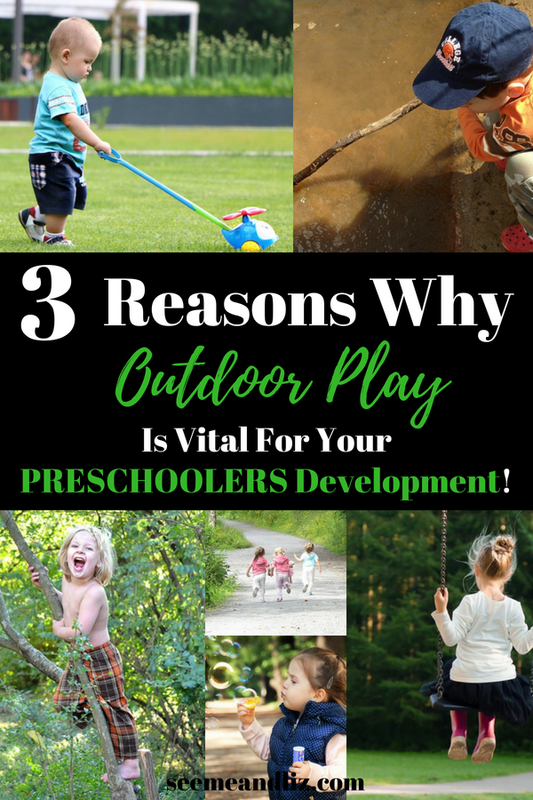 It’s pretty easy to see that there are many benefits of outdoor play for preschoolers! What are some of your favorite outdoor childhood memories? Share some things your children love doing outside! I really like this post. My son is outside all day, everyday. I have to practically drag him inside when it starts getting dark.He gets covered head to toe in bug bites every summer but he has tons of fun with all his neighborhood friends and it takes some of the pressure off me to entertain him lol. I also have a website and I actually just wrote an article last week about some cheap outside activities for kids! Wow Shay! That is great that your son is spending so much time outside. Hopefully it will stay that way! What is your website? I would love to take a look at it. One of my favorite childhood memories was catching tadpoles by the river. I would put them in a bottle, look at them swim and release them again. The other one was just cycling around the neighborhood with my brother. I was scared of cycling, but once I got hold of it, I couldn’t stop. Those were in the 90’s before anyone owned a cellphone and internet wasn’t even a thing. How I miss those days! I think it’s more challenging to get kids out nowadays because they are so glued to digital entertainment. It’s funny you mention tadpoles. We have a community pond (aka storm water runoff) behind our house and the kids caught a bunch of tadpoles there last weekend. They were outside for hours and had so much fun! That is true learning through play. You’re right about the lure of digital entertainment. Kids are drawn to it like candy. But parents still need to be parents and set rules and boudaries. 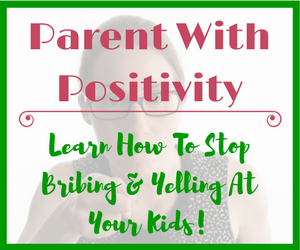 There will be tantrums along the way, but the benefits of being outside for kids outweigh parents not having to deal with an upset child! Great post Tanya! Thank you very much for sharing it. In the past, we used to play out a lot and come back home when it gets dark. But now because of the technology kids don’t want to play outside and prefer playing with tablets and watching TV. How true everything you say! They need to socialize, take the advantage of sunlight, get exhausted and get hungry. It is very good for their development. My nine year old daughter likes outdoor play very much. We are looking forward to summer holiday. Thanks for your comment Halide. If given the choice, my son would stay inside either playing with Lego or in front of a screen. My daughter on the other hand chooses outdoor play over just about everything else. I believe it is part of our responsibility as parents to make sure our children get time outside, running around and away from screens. Most parents monitor what their children eat and help them make good food choices, so the same should apply for other ways that they develop. Being sedentary and staring at a screen for hours is not going to be good for their physical or mental development! You are right Jessie, the mental health benefits that come from being outside and being active are great! Both for adults and children. I am happy that you see the value in outdoor play for children! Playing outdoors also means kids get sunlight exposure and can make vitamin D. A study in teh UK found that because kids weren’t playing outdoros, and were being covered up and slatherd in sunscreen, one in those seen in an orthopaedica clinin in Southampton showed bone signs of vitamin D deficiency. Rickets is coming back! Obviously kids need protection against sunburn, but 15 minutes in the sun, without sunscreen, is all you need to make a good amount of vitamin D. Otherwise, vitamin D supplement are vital. Thanks for your comment Dr. Brewer! You are right, vitamin D deficiency is becoming much to common with children. I only put sunscreen on my children if they are out playing between they hours of 11am and 3pm. If it is before or after that they go out without sunscreen! Really enjoyed reading your content and was very easy to read. I think your right children do need to play outside more. I am guilty of this as I have two children and all they do is sit in front of the tv screen all day. 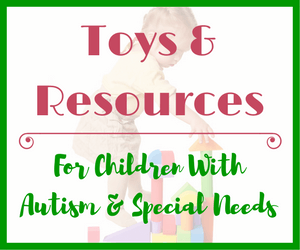 I didn’t realize how important it was and that it strengthens their cognitive, social and emotional skills. I will have to start making some time to take them out more to the park! 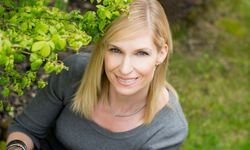 I am glad you found some valuable information with regards to the many benefits of outdoor play for preschoolers. In addition to the points I mentioned, Dr. Sarah Brewer also commented with another good point which is getting kids a natural dose of vitamin D, which they can get from the sunlight while playing outdoors! If you get your kids away from screens when they are young, it won’t be as much of a challenge when they are teens as they will have been used to screen time limits!